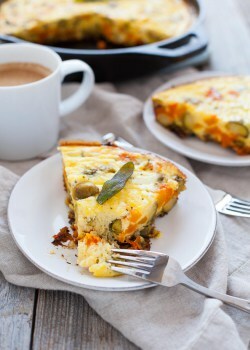 Looking for a delicious vegetarian side dish for the holidays? 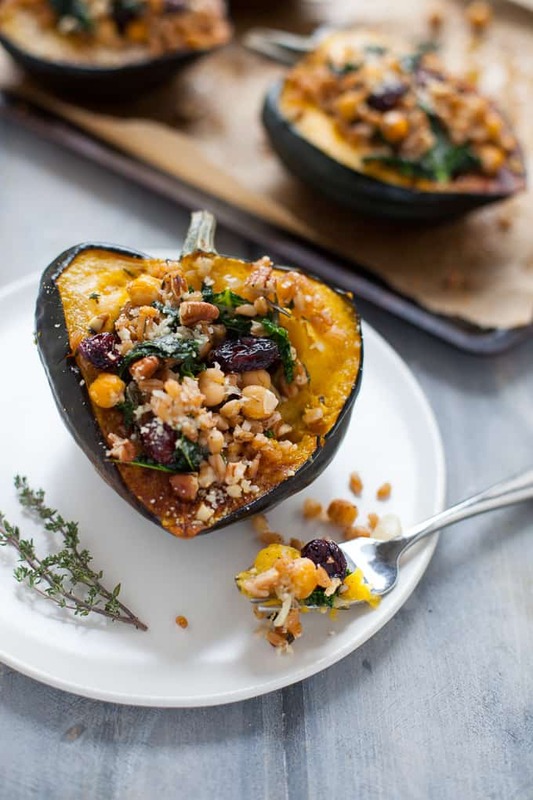 You gotta try my easy Thanksgiving Stuffed Acorn Squash made with farro, chickpeas, kale and cranberries! Gosh, I really can’t believe I’m posting a Thanksgiving recipe right now and that it’s only two weeks away! Does anyone else feel like you blinked and 2017 was basically over? This time of year is always difficult for me. Not the holidays but the transition to fall that feels like winter. What I’ve learned about myself (or rather come to terms with and accepted) over the last couple years is that I’m a deeply sensing person and thus I feel everything deeply, including seasonal transitions. I usually notice a spike in my anxiety around October/November as the days are getting shorter and I’m spending less time outdoors and more time inside. As someone who thrives on and finds grounding in being in nature and sunshine, it’s difficult to grieve that loss and accept the desire to hibernate under blankets and not leave the house. I see this in my private practice clients too – this spike in anxiety and depression this time of year. And often they point to food or their relationship with food as being the issue. And certainly that’s part of it. But I think it’s also important to acknowledge the transition that’s around us. I’m a big fan of the work of Sheryl Paul and she recently published a blog post that talked about how the Christmas decorations and holiday hoopla come on full force the day after Halloween because we need a distraction. We have trouble sitting with the sadness that comes along with the onset of fall and winter. We have trouble finding stillness and being with ourselves during this time of hibernation and so we distract with the holiday frenzy. If this is resonating with you, I invite you to experiment with what it would be like to slow down this time of year. To embrace the grief and sadness rather than trying to brush it under the holiday rug. Might you take time to meditate? 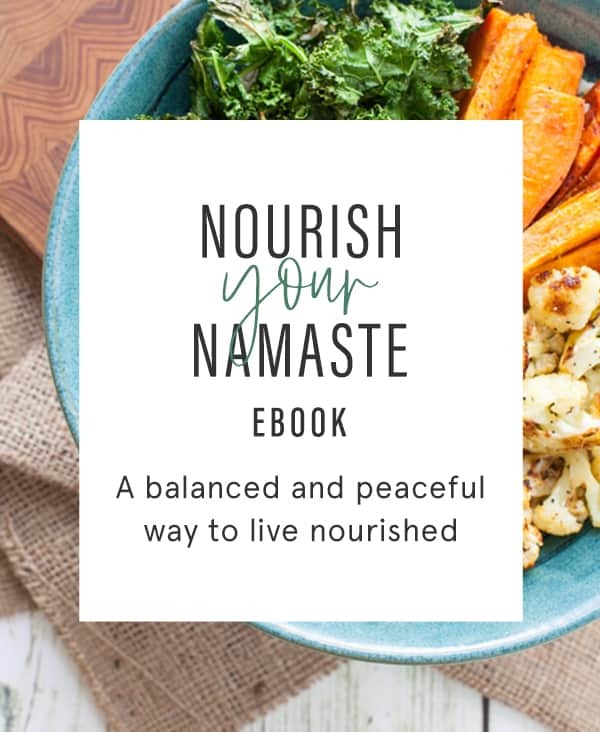 To take a yin/restorative yoga class? To journal? To spend time baking and cooking hearty, grounding recipes like the one I’m sharing today? I LOVE this recipe. I ate it for dinner last night and if Thanksgiving had a taste, this recipe would be it. I took my first bite and felt like I was eating Thanksgiving (as if you could eat a holiday). 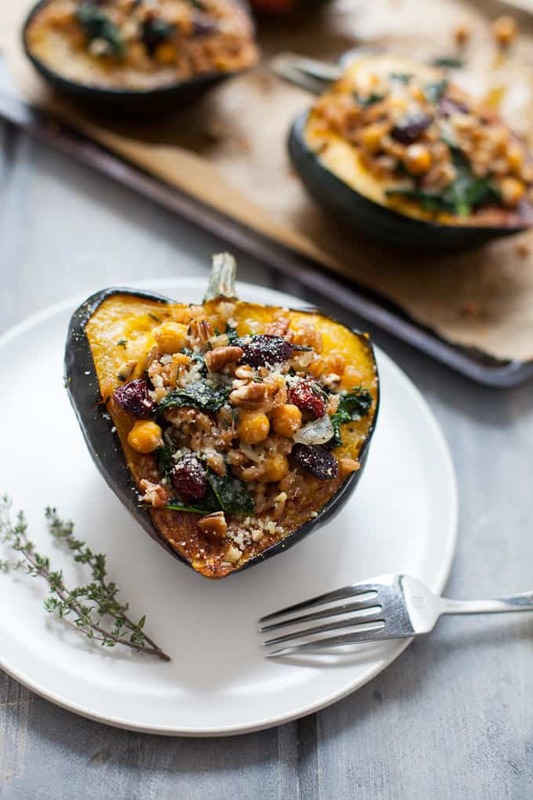 The fresh herbs reminiscent of the holiday like thyme and rosemary add a delicious savory component, which is contrasted so nicely with the sweet acorn squash and sweet/tart cranberries. I found myself just eating the stuffing by the spoonful too because it was that good. I could see the stuffing being really delicious repurposed over some greens for a hearty fall salad. I added parmesan cheese for a little extra dose of savory, umami flavor but if you’re vegan, you can totally leave that out or add some NOOCH instead. Make this for your vegetarian guests for Thanksgiving or add a little leftover turkey the day after if you wish. Either way, this is packed with flavor and plant-based protein thanks to the chickpeas! Preheat oven to 375 degrees F. Brush squash with 1 tablespoon olive oil and season with salt and pepper, to taste. Place squash cut side down on a lightly sprayed baking sheet and bake for 40-50 minutes, or until fork-tender. Add farro and vegetable stock to a medium saucepan and bring to a boil. Reduce heat to a simmer, cover, and cook for about 30-40 minutes, or until farro is chewy but no longer tough. Drain excess liquid. In a large sauté pan, add 1 tablespoon olive oil over medium heat. Add onions and let cook for about 5 minutes, or until translucent. Add garlic and let cook for another minute. Stir in kale and add 2 tablespoons water and cover for 4-5 minutes, or until wilted. Reduce heat to low and continue to cook for 2-3 minutes. Stir in cooked farro and chickpeas. Remove from heat. Add in thyme, rosemary, pecans and cranberries. Season with salt and pepper, to taste. 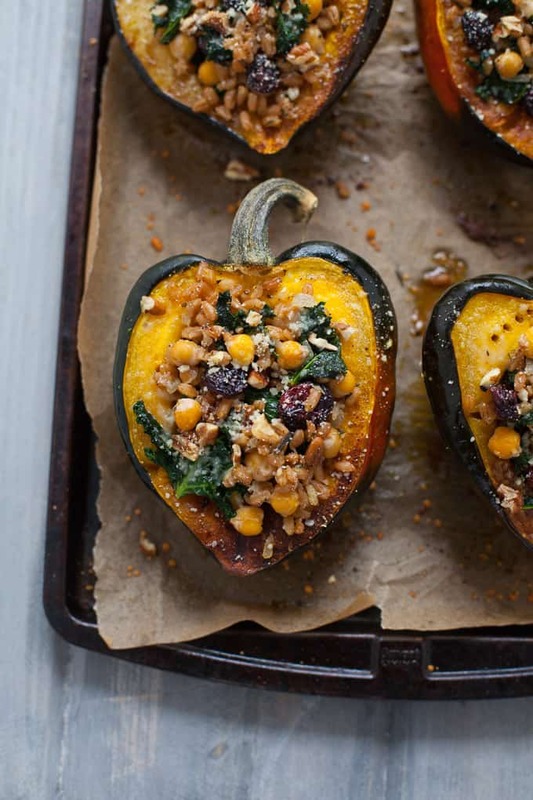 Reduce oven temperature to 325 degrees F. Fill each squash with about 1/2 cup farro mixture. Top with Parmesan cheese. Bake for another 15 minutes, or until filling is heated through. For more Thanksgiving inspiration, check out my recipes below! I made this last night and it was amazing! I will be making this again. Thank you for the recipe. I made this two nights ago and my boyfriend and I absolutely loved it. I posted a picture of it on facebook that received many comments and requests for the recipe. I posted your link so my friends can all enjoy this wonderful dish and I am now a devoted follower of your blog. 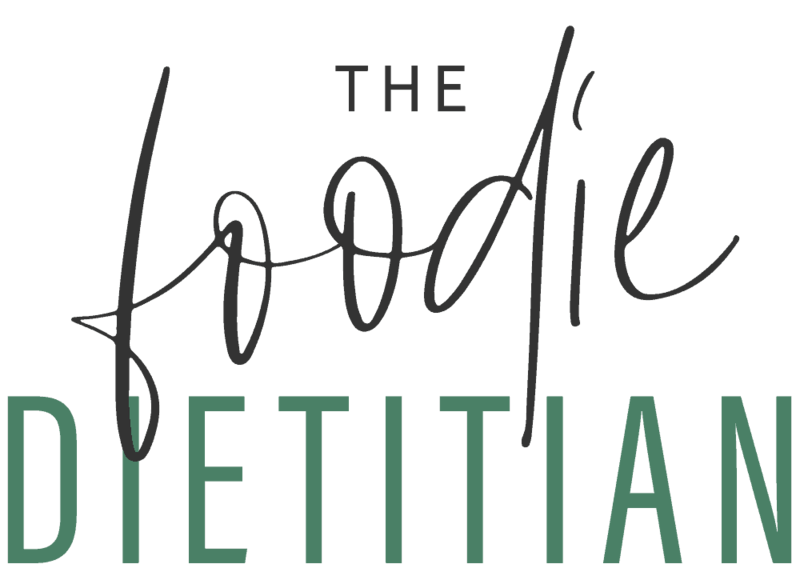 Thank you for all the delicious, healthy recipes. Oh that’s awesome. Thanks so much for sharing, Veronica! So glad you’re here following along! This was delicious. For a busy day meal for guests, I cooked the squash the day before. Then cooked the filling a couple of hours before. Made a vegan topping of panko, smoked paprika, and EVOO. Assembled the cold/lukewarm elements and heated in the oven at 325* for 25 min. Everyone raved about it! Thank you. So smart to make the squash the day before! Thanks for sharing, Gail! So glad everyone loved it! 2. I added some chopped mushrooms – go so well with the faro and fresh thyme. I will make this again and again! Nice, Lisa! Love the addition of chopped mushrooms – yum! Yum! I usually use quinoa but farro is a great change of pace. Yes it’s a little heartier and nuttier. Perfect for acorn squash! 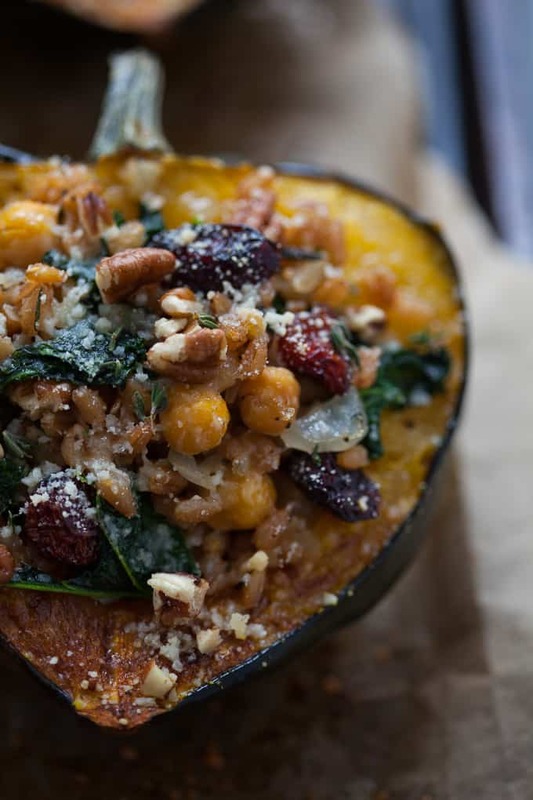 Yay for stuffed squash! I love all the colors in this! <3! This looks right up my ally for Thanksgiving! Looks delicious! Do you think I could make the stuffing the day before? I made this tonight. Delicious and vegan for my teenaged daughter. Served it with apple sauce. Thanks! Great! Glad you both enjoyed it! Thanks for sharing, Joanne! This is so festive and sounds delicious! Mmm omg this sounds amazing! Also can’t believe Thanksgiving is right around the corner! Kara, these look absolutely FANTASTIC! 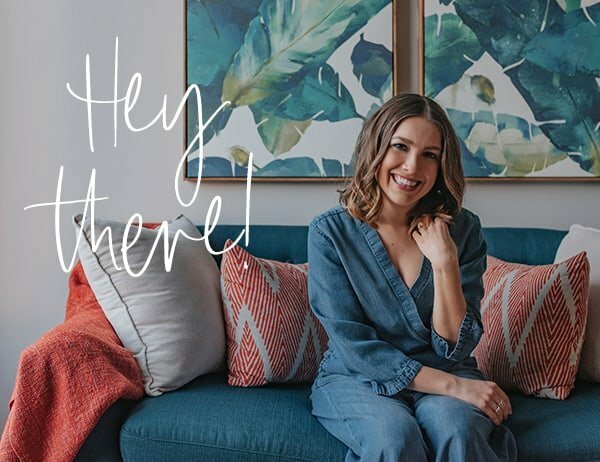 I first learned how to cook with farro when I was interning at a vegetarian cafe in which the owner/chef had made several trips to Italy and brought back several dishes that we used during out plated themed dinners. Farro is used quite a bit in Northern Italy and I just LOVE it. I can’t wait to try these! I love stuffed squash! Thanks for sharing, looks great! I always forget about acorn squash. It’s so tasty! Thanks for the reminder, this looks great! 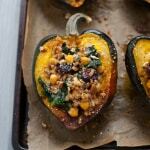 I love stuffed winter squash! I need to remember the parchment paper! I love acorn squash! Great idea! 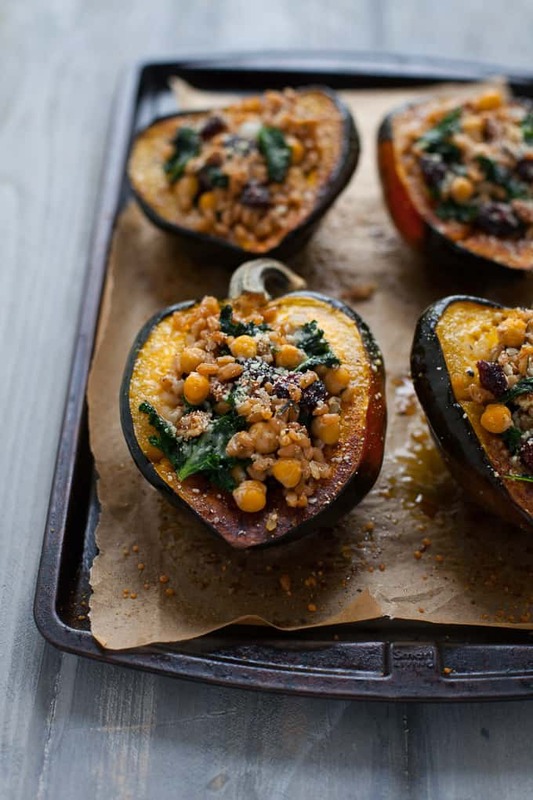 These stuffed acorn squash look delicious! 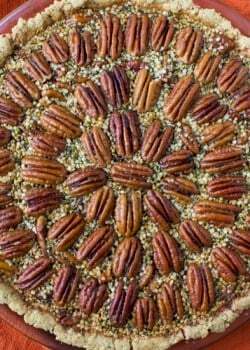 What a great idea for Thanksgiving (or a fall dinner)!!! Agreed with the shorter days, anxiety and difficulty sitting still. Need good, productive distraction for sure (and maybe some more yoga). And this dish really does look divine! Yeah, it’s really tough. Thanks, Lauren! 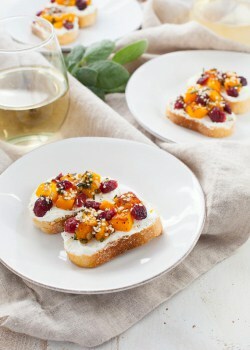 What a pretty recipe! I love the addition of cranberries. I have a bag in my fridge waiting to be used! This dish is SO gorgeous! !